This is part 2 of a 4-part series previewing the 8 teams in the World Cup of Hockey (part 1: Team Canada/Team Europe – http://thesportscrew.com/2016-world-cup-of-hockey-preview-part-1-team-canadateam-europe/). How Can Sweden Win The World Cup? Potent Defense – Team Sweden boasts the best defensive unit in the tournament, lead by two-time Norris Trophy winner Erik Karlsson. Sweden has a number of offensive threats on their roster, but the trio of Karlsson, Oliver Ekman-Larsson and Victor Hedman is the best 3 of any team in the World Cup. What makes them such a talented group is the two-way guys behind those top 3, including defensive specialist Niklas Hjalmarsson and Anton Stralman. Rikard Gronborg is expecting a big offensive impact out of Karlsson and co. on defense, one that could be the difference-maker for Team Sweden. King Henrik – Lundqvist has been the face of Swedish hockey for over a decade now, at age 34 he has been nothing but consistent for the Yellow and Blue. He lead them to Gold in Turin in 2006, and took Sweden to the Gold Medal game in Sochi where they lost 3-0 to Canada. Sweden has a very strong group with 3 of the best offensive teams in the tournament in North America, Russia and Finland, so Lundqvist will be a very busy man between the pipes. If he can find his groove early on, Lundqvist could play a key role in leading Sweden to a World Cup win. 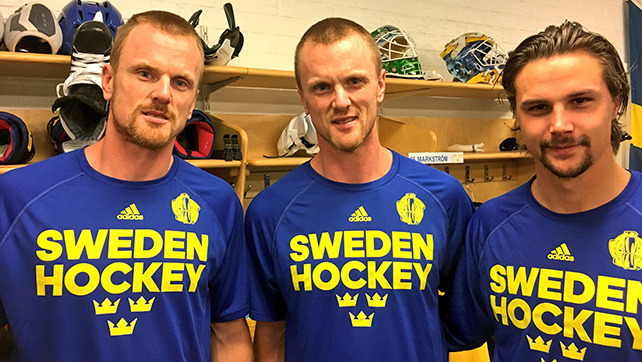 Swedish Twins – Just like Lundqvist has been a consistent member of Team Sweden over the last decade, so have brothers Daniel and Henrik Sedin and they are ready to lead the way at the World Cup. With Captain Henrik Zetterberg dropping out with an injury, Gronborg decided to named Henrik as their new Captain and Daniel as an Alternate Captain. With a relatively young Swedish team (just 6 of 22 players 30 or over), the brothers will be relied upon heavily to provide leadership while also leading the way offensively. If the Sedin’s can find the score-sheet early and often in this tournament, that could spell trouble for opponents of Sweden. What Would Keep Sweden From Winning The World Cup? Missing Captain – Sweden has lost a number of players before the World Cup, but none bigger than when Captain Henrik Zetterberg dropped out with a knee injury. Zetterberg was an important part of Team Sweden winning Gold in Turin in 2006, as well as the Silver-medal winning team in Sochi in 2014 and has competed over 10 times for them internationally. Team Sweden still has the talent to be successful in this tournament, but there’s no question that losing Zetterberg hurts them offensively and leaves them without a guy that a lot of young players look up to. Tough Preliminary Competition – If Sweden wants to go far in the World Cup, it starts in the group stage where they have the tough task of playing Finland, North America and Russia. These are 3 of the most offensively-gifted teams in the tournament, and if they want to make it to the medal round they are going to have to play perfect team hockey. Rikard Gronborg’s group has looked slow and shaky in the preliminary round, losing 2 of 3 games and allowing 12 goals during that time. Time will tell if Sweden has the offense to survive this group, but they have 3 teams they need to match step for step. Goaltending Questions – You can see above how integral Henrik Lundqvist is to the success of Team Sweden, and when he’s on his game he is one of the best goaltenders in the NHL. But he has struggled in the preliminary round and even as far back as last NHL season, and that’s something to worry about for Rikard Gronborg’s team. They are very thin behind Lundqvist with Jhonas Enroth and Jacob Markstrom, neither of these guys are capable of leading Sweden to a World Cup win. That means extra pressure will be on King Henrik to perform well in this tournament. How Can Czech Republic Win The World Cup? Mrazek the Magnificent – Leading the way in net for Czech Republic is Red Wings goaltender Petr Mrazek, and he’s an integral person to his team’s success in this tournament. The 24-year old goaltender took over for Jimmy Howard as starter for the Red Wings this past NHL season, and he has shown that he is capable of being the #1 against the best competition in the world. Mrazek will be a busy guy between the pipes for the Czech Republic, and if they are going to have success in this tournament, they will need Mrazek to steal a game or 2 along the way. Leadership Group – The Czechs have a roster full of players with little to no international experience, and that means Josef Jandac will rely heavily on his leaders Tomas Plekanec, Jakub Voracek and Ales Hemsky in this tournament. Not only are these 3 of the most offensively-gifted players on the team, but veterans of Team Czech Republic who need to lead the way for the younger guys. Voracek in particular will be relied up heavily to score big goals for his team, and the powerplay will run through #93. Look for a big part of Team Czech Republic’s offense to run through Plekanec, Voracek and Hemsky. Two-Way Centers – While the Czech’s may not have the most offensively-gifted roster in the tournament, they do have a group of centers that are excellent two-way defenders. Captain Tomas Plekanec is expected to match all the #1 centers in the tournament, a job that he usually has with the Montreal Canadiens in the NHL. Beyond Plekanec at center, they also have two-way guys Martin Hanzal, Vladimir Sobotka and Radek Faksa ready to contribute at both ends. If Czech Rebuplic is going to have success in this tournament, they are going to need to limit the offense of their opponents and the team’s centers play a crucial role. What Would Keep Czech Republic From Winning The World Cup? Where’s Jags? – The best player to ever represent Czech Republic in international hockey in Jaromir Jagr has instead decided to focus on the upcoming NHL season and skip the World Cup. At age 44, he would have been the oldest player on the team by 11 years, and has decided to keep his body as ready as possible for the upcoming season with the Florida Panthers. They are going to miss #68 for a number of reasons; the guy is not only a natural leader and previous team Captain, but he would have been their best player and a go-to guy on offense. The whole hockey world loses not getting to see Jags on the big stage, but it hurts the Czechs the worst. Key Injuries – I mentioned the impact that not having Jagr has for the Czechs above, but injuries have also cost them the services of David Krejci, Tomas Hertl and Radko Gudas. Krejci is a big loss considering he was slated to be their #1 center, and Hertl/Gudas both bring experience that would have been helpful to Josef Jandac’s team. Without these guys the Czechs are a much weaker team on offense, and we know that already they don’t have the offensive firepower to match some of the teams in this tournament. It remains to be seen if these injuries will hurt the Czechs, or if the replacements will make their impact. Below-Average Defense – The weakest link for the Czech Republic in this tournament is on defense, a group that on paper is the worst of all teams competing. The defense has some NHL regulars like Roman Polak, Andrej Sustr and Zbynek Michalek, but this is a group with little international experience. In fact just one of the 7 defenseman (Michalek) on the team was on the roster 2 years ago in Sochi. This group is going to have a very tough task matching some of the high-powered offense in the tournament, including Canada and USA in the group stage.